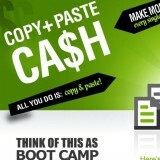 “Copy Paste Cash”, by Justin Middaugh and Thomas Butler and found at copypastecash.com, is a company that offers a marketing boot camp for new to online marketers. They provide training that won’t overwhelm the newcomer. Since this online marketing training program is set up for beginners, there really is nothing here to offer to those already experienced in the business. The system is set up with basic tools and techniques. There are a few issues with their “Copy Paste Cash” system. The methods they teach are a bit ineffective; such as suggestions to post ads on craigslist. This practice is somewhat obsolete nowadays. Too many people are already doing this, including your competition on Copy Paste Cash. When craigslist competitors see the same ads you’re placing as them, your ads will be ghosted repeatedly. Ghosting is an illegal collusion act. Another example of ineffective tools is the lack of conversion on the ad copy for the offers they provide, which makes it hard to make money using the ‘Copy Paste Cash’ system. Without teaching you how to grow your leads list that makes it even more difficult. They also don’t provide an effective method of capturing leads. Growing a list is the main way to make money in marketing, so it’s a bit disturbing to find this tool missing in their tutorials. For the money you pay to join Copy Paste Cash I find many of the instructions and tools either too basic, or not adequately applicable for success. That said, at least they don’t try to ‘upsell’ you to more expensive levels, as many scams do. You may not make much money online with this system, but you’ll learn a few things to get you started. But their claim that you can make a hundred a day easily is somewhat ambitious. This is what put “Copy Paste Cash” square in my sights to research and review. Copy Paste Cash is only teaching you to promote their system. There are better programs available that will help you to run your own business. They do, however, make it relatively easy for beginners to follow their online marketing training system. I won’t call it a scam, since they do have a good money back policy and you might learn a few things. However, I do not recommend “Copy Paste Cash” as a way of making any kind of substantial earnings. we did not call it a scam either. we just do not recommend it as a way to make any substantial earnings. please taske time to go over our review, thanks!